-- Select a Size -- Small 11-14" x 3/4" - Out of Stock! Medium 14-20" x 1" - Out of Stock! 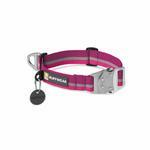 Large 20-26" x 1"
Be prepared for the great outdoors with the Top Rope Dog Collar by RuffWear in Purple Dusk. Posted On 08/11/18 by Stephanie D from , Yes, Stephanie D recommends this product! We love Ruffwear for its heavy duty function and style. Posted On 06/12/16 by Stephanie D from Greeley, CO Yes, Stephanie D recommends this product! 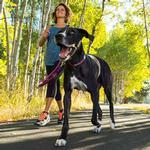 We love the ruffwear brand products. Sturdy and cute at the same time. excellent quality; speedy service; much to choose from.